In this dish, the eggplant are dredged in flour and browned before adding to the pot, giving the dish a lovely mix of textures and tastes. 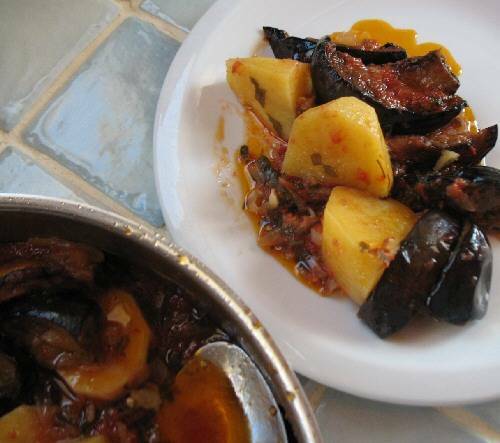 These are the classic Greek tastes: eggplant, potatoes, tomatoes, onions, herbs, and olive oil. To start: Soak eggplant pieces in water for 30 minutes. Make the sauce: In a stew pot, combine tomatoes, parsley, onion, 1/2 cup of olive oil, 1 1/4 cups of water, and 1/2 teaspoon of salt. Bring to a boil, cover, and cook over medium-high heat for 15 minutes. 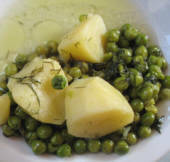 Stir in potatoes and 1/4 cup of water, cover, and cook until the potatoes are done, about 20 minutes. 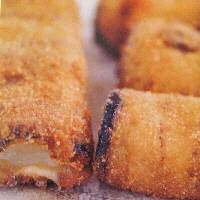 Fry the eggplant: While the sauce is cooking, drain the eggplant and season with 1/2 teaspoon of salt. Heat 4 tablespoons of olive oil in a frying pan over high heat. Dredge the pieces of eggplant in flour and fry until golden brown on all sides. Place fried pieces in a strainer so excess oil will drain off.